You can check out and use these and other banners, text ads, flyers, and more at the SFI Marketing Center. “Zack is Back” Enter Your Prediction For The New Time Machine Contest! Enter your prediction for the new Time Machine contest! What will the all-time box office rank for the new movie THE MARTIAN be on Oct 21st? TIP: You can enter a prediction daily to win a share of what will, no doubt, become a HUGE Zackpot. And with each Time Machine entry, you also can get a free entry for the Daily Crown and a chance to win a share of over $1,700 in prizes! NO PURCHASE NECESSARY. Don’t Forget “Today” Monday AUGUST 31st, is THE S-BUILDER CO.OP. Last Day to Secure SIGNUPS FOR September. 1. To get in on the August S-Builder Co-op. Just plug in to our global advertising co-op and within a few weeks begin receiving signups (both SFI affiliates and TC members). Just 72 cents a day gets you on your way; it’s one of most economical ways to build an online business ever! For complete details, extensive FAQs, and an order link for S-Builder, see the S-Builder central info page. 2. To retain your Executive Affiliate status for August. If you’re under 1,500 VersaPoints for this month, get to your SFI Homepage at the Affiliate Center right away and see your SFI To-Do List for a list of ways to acquire the points you need. 3. To vote for August‘s TripleClicks Song Of The Month. 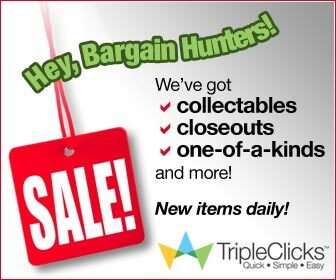 Please drop by the TripleClicks Music Center today and help us pick this month’s top song. Our TC Artists from around the world thank you!